The first day of spring…it’s finally here. This is definitely my favourite time of year. I love to see my garden come to life after hibernating all winter long. Over the next week few weeks, I’ll be teaming up with Janelle from Flowers by Janie for inspiration on spring wedding flowers. Watch for “Bloom of the Week” where you can learn about a pretty spring bloom and how to use it in your wedding. The hyacinth is a spring flowering bulb typically available from January to April as a cut flower in North America. The flowers are native to the eastern Mediterranean, Iraq, northeast Iran and Turkmenistan however, the Netherlands are the largest commercial producer and distributor of the cut flower which we enjoy. 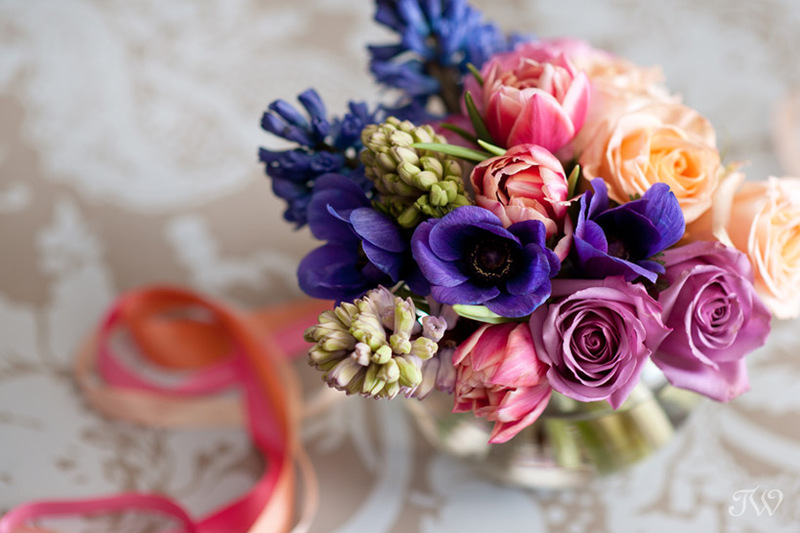 Hyacinths are available in white and pastel shades of lavender, pink and blue as well as rich purple and magenta hues. In the language of flowers the hyacinth represents constancy with the blue hyacinth symbolizing sincerity. They have multiple, uniquely shaped florets along their soft spike-like stem and add texture to spring bouquets and arrangements. They prefer vase arrangements to floral foam, usually having a longer vase life when placed directly in water. 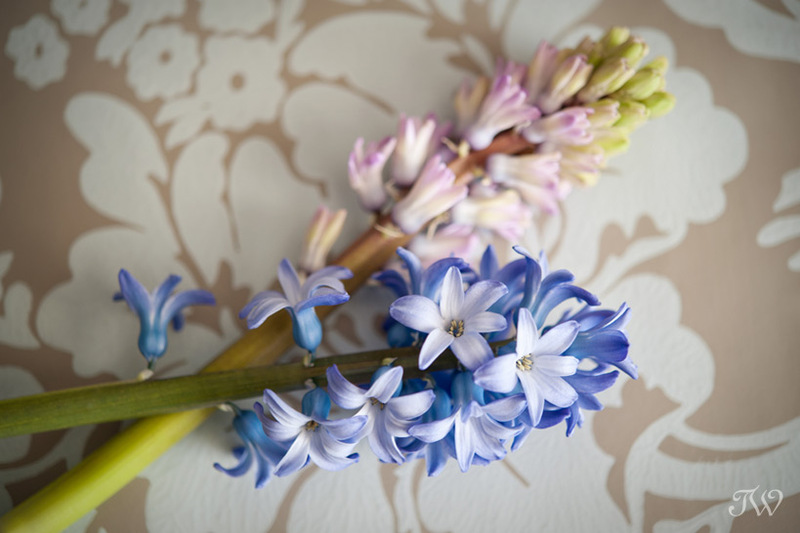 Hyacinths have a strong, heady fragrance so a couple of blooms are all that is required for impact. They give off a sap like substance once the stem is cut away from the bulb, which causes water to quickly turn murky. It is best to use a coloured or solid vase (as opposed to clear) if you are unable to change the water every couple of days. At Flowers by Janie, we love using hyacinths in our spring wedding and event arrangements for the unique shape, texture and fragrance they bring to our designs. Thanks Janelle. Be sure to pop back for more spring blossoms.